A discovery about the way in which bugs spread throughout the body could help to develop stem cell treatments. Researchers at the University of Edinburgh have found that bacteria are able to change the make-up of supporting cells within the nerve system, called Schwann cells, so that they take on the properties of stem cells. Because stem cells can develop into any of the different cell types in the body – including liver and brain cells – mimicking this process could aid research into a range of degenerative conditions. Scientists made the discovery studying bacteria that cause leprosy, which is an infectious neurodegenerative disease. The study, carried out in mice, found that in the early stages of infection, the bacteria were able to protect themselves from the body’s immune system by hiding in Schwann cells or glial cells. 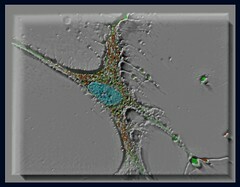 Once the infection was fully established, the bacteria were able to convert the Schwann cells to become like stem cells. Like typical stem cells, these cells were pluripotent, meaning they could then become other cell types, for instance muscle cells. This enabled the bacteria to spread to tissues in the body. The bacteria-generated stem cells also have another unexpected characteristic. They can secrete specialized proteins – called chemokines – that attract immune cells, which in turn pick up the bacteria and spread the infection. Scientists believe these mechanisms, used by leprosy bacteria, could exist in other infectious diseases. Knowledge of this newly discovered tactic used by bacteria to spread infection could help research to improve treatments and earlier diagnosis of infectious diseases. Professor Anura Rambukkana, of the Medical Research Council (MRC) Centre for Regenerative Medicine at the University of Edinburgh, who led the research, said: “Bacterial infections can completely change a cell’s make up, which could have a wide-range of implications, including in stem cell research. The study, carried out in Professor Rambukkana’s laboratories at the University of Edinburgh and the Rockefeller University, was funded by the US National Institutes of Health. It showed that when an infected Schwann cell was reprogrammed to become like a stem cell, it lost the function of Schwann cells to protect nerve cells, which transmit signals to the brain. This led to nerves becoming damaged. Professor Rambukkana added: “This is very intriguing as it is the first time that we have seen that functional adult tissue cells can be reprogrammed into stem cells by natural bacterial infection, which also does not carry the risk of creating tumorous cells. Professor Rambukkana, who is Chair of Regeneration Biology at the MRC Centre for Regenerative Medicine, is also a member of the University’s Centre for Neuroregeneration and Centre for Infectious Diseases. Mikey along with owner Stephan Nadzam. Dr. Michael Herman, one of the first veterinarians in Charlotte to offer stem cell therapy for animals, used an innovative stem cell procedure to regenerate growth in Mikey’s hips and leg joints. First, Dr. Herman extracted fat tissue from behind the shoulder area of Mikey. Then his technician at the hospital then adds enzymes to “photo activate” the cells, which in turn accelerates the regeneration of cells. Dr. Herman then injected the regenerated cells directly into the joint areas while intravenously administering any leftover cells. “I normally take about two tablespoons of fat from either the shoulder area of the animal or the abdomen and within that fat is five to 50 times the amount of stem cells than what we can get from bone marrow.” Stem cells are the body’s repair cells, and they have the ability to divide and differentiate into many different types of cells based on where they are needed throughout the body. 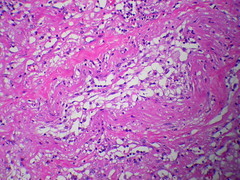 The cells can divide and turn into tissues such as skin, fat, muscle bone, cartilage and nerve, said Dr. Herman. Dr. Herman performed the procedure on Mikey in the end of November and within the first 24 hrs he was up and mobile. Mikey’s owners noticed continued Improvement over the following days and noted that since the treatment, they have not fed Mikey any pain medication. Dr Herman said, “He has had a 95 percent success rate and sees “amazing” differences in his patients on average about 45 days after procedures.